Financial freedom, or financial independence is the common theme when you are browsing through the personal finance blogs (locally or internationally). 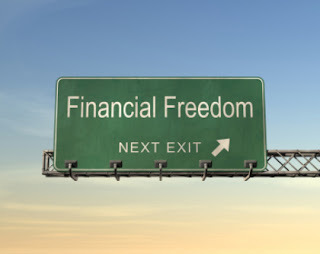 While it is definitely in the mind of most financial bloggers (me included), and a number of us (me excluded) are already in that state, it is worth mentioning that achieving financial freedom is not the END of our journey,in fact, it is just the START of another journey. The question is, will you really change who you are (before achieving financial freedom) and become who you really set-up to be (after attaining the financial freedom)? My take is, you will continue to eat whatever you eat, take the same transport that you are taking day in day out, live your life as per normal, before and after you achieved the financial freedom. What really might changed is your mindset and inner sense of confidence about your financial state. 1. Short-change ourselves - I know some friends are very rigorous in achieving their financial freedom goals and set-up very tight budget on their daily spending (again, I am not against it), but I think occasionally it is important to reward ourselves to keep the momentum going e.g. having a better meal, travelling with families or loved ones etc.. It might set-back our goal a little bit but not to forget that we can only live at PRESENT! Just like estimating the future growth of a company, who can guarantee the future? Of course, the best approach is to save some money for such indulgence that will come in handy. 2. Wait for the financial freedom - Again, financial freedom might never come, so, if you have some goals that you wanted to do after financial freedom, you should start doing it now (maybe in a smaller scale) instead of just postponing it. Besides, by the time you achieved financial freedom, your mind and body might have passed their prime! So, act now instead of waiting. 3. Translate everything to monetary term - Yes, money is important but not everything can be bought by money. Never sacrifice your joy, the friendship, the quality time with family and loved for the sake of earning more money. If no one can share the value of money with us, it is rather meaningful, don't you think so? Life is more than the number in our bank. Our Life worth is not our net worth. There are too many things like health, emotional well-being, family bonding and etc are not measured by earnings we make. Once we have lost our healthy body; even we have lots of money and lots of free time we also can't do much activities. Regardless of what financial status, live everyday as if it is the last but plan as if we live till 100 yrs old. Frugal daddy : well said. I know you have all planned out... Keep it up..
We should not make the mistake of using future goals as a substitute for living in the NOW. We can only live in the present. Not in the past and not in the future. And always enjoy the roses along the way (experiences and not stuff!). A frugal life-style is not to be mixed up with being stingy. Instead it is focusing on getting the biggest happiness bang for my buck. Most important is before financially free to save $$, one ought to be eating more healthy conscious and exercise daily to live until old age.. With all the delay gratification and eating junk food magi mee, one should eat healthy food and go for 30 minutes exercise to look good. Exercise is the key word before investing $$ into equitites and insurance but with sg a food haven, most eat oily food,sleep late and never exercise..
Succint & to the point. Great post.